Lentils are legumes harvested from pods and usually dried and stored for use in stews, curries and soup dishes. Lentils are high in carbohydrates as well as protein, with more protein per cup than rice. According to the U.S. Department of Agriculture's National Nutrient Database, lentils also have less fat per serving than rice, with 0.75 g to the 1.62 g found in brown rice. Vegetarians or diabetics often substitute lentils for rice for greater nutritional content per serving. Read the recipe to see how much rice is required. One cup of dried lentils yields nearly 2 cups of cooked lentils; 1 cup of uncooked rice, meanwhile, yields from 3 to 4 cups, the USA Rice Federation website advises. Therefore, you should use 1 1/2 to 2 cups of dried lentils for every cup of dried rice required in a recipe. Increase cooking time for lentil recipe substitutions by five to 40 minutes. Rice typically cooks within 20 to 30 minutes; long-grain brown rice is an exception, cooking for 40 to 45 minutes. While lentils are cooked within 15 to 20 minutes, they become most tender after 40 to 60 minutes. If you prefer more firm lentils, no time adjustment is required. 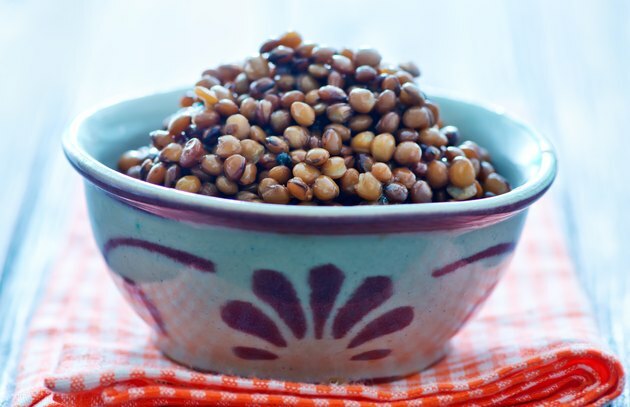 Choose lentils instead of rice when seeking higher protein content or higher fiber content. Brown rice has 4.52 g of protein and 3.5 g of fiber per 1-cup serving, while lentils have 17.86 g of protein and 15.6 g of fiber for only 12 more calories per serving. Red lentils cook faster than green and brown lentils — 25 minutes compared to 45 minutes. Older lentils require longer cooking times compared to more recently dried lentils. Tasting lentils 15 minutes prior to the anticipated completion time helps determine if they are nearly done. Overcooked lentils become mushy.